Lobelia There is 1 product. One of america lobelia plant. On reddish stems evergreen lanceolate erected forming a spreading tuft. Very long flowering. 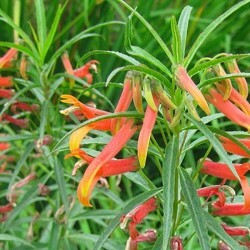 Narrow tubular flowers are declining in the yellow, orange and red orange yellow. Drained soil, humus, cool but supports drought.